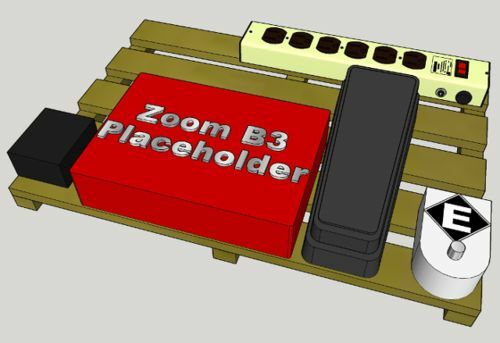 Bass / Guitar Players pedalboard build #1: Requirements and design concept. Like many of you, I have other interests beyond woodworking that sometimes cross over. For me, it is music. I am a bass player, and staring to learn to play guitar (Thank you Yousician!). My Bass rig, while not exactly what you are going to see a stadium rock band bass player use, is quite extensive for a weekend warrior type. Including effects pedals, and I needed a way to organize them, and keep them where I want them when in use. This brought my V1 pedalboard. It’s an 18” deep x 24” wide piece of 3/4” plywood. There is 2” velcro loop side tape on it spaced 1” apart. Consider this my learning experience / what needs to change and why. From left to right they are. #1. Fender single button overdrive control. #2. 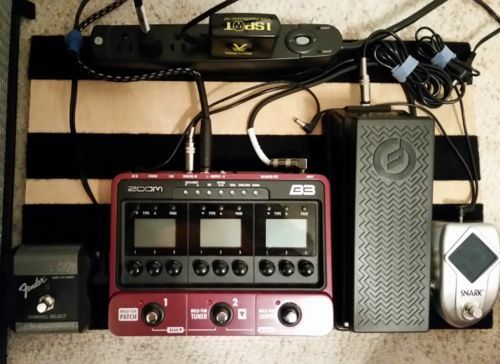 Zoom B3 bass multi effects pedal #3. Moog universal expression pedal. #4. Snark SN-10S tuner pedal. This configuration is bulky, the 3/4” ply is unduly thick and heavy, and the cabling management is a nightmare. I need a way to tuck cables underneath, get an angle toward me, and not waste the massive space behind the expression pedal. I am also finding that the Snark tuner pedal while a great tuner, is redundant. The Zoom B3 has a MUCH better built in tuner than I had anticipated before I got it, and I find I don’t even really use the Snark tuner. The design I whipped up in Sketchup was a quick and dirty about getting the way to route cabling underneath. What i need as well is. #1. Less overall depth. Move the power strip under the board, or better yet, eliminate it from the board and use the OneSpot for everything. #2. No angle toward the user, not a problem with the Zoom, or Fender pedals, but that expression pedal without being angled toward me is a BIG problem. Use only 4 of the 2” wide strips instead of 5, space them 1” apart. The front to rear members are going to be tapered cuts. The jig is already set just need to double check and make the cuts. Move the Snark tuner out for use with the guitar instead of bass. Keep the 24” width, that is no problem. Even without the Snark, it just provides me a space if I want to add an extra pedal on down the road. Not likely ,but possible. The taper for the front to rear members will be 1/2” on the front, and 2.5” on the rear for a total rise of 2”. The vertical spreaders on front and rear will be proud of the tapered front / back pieces by 1” to “capture” the slats. I am planning on some clean forstner cut holes through the front / rear pieces to pass signal and power cable through. The joinery will be 1” wood screws and glue. Before the Velcro loop part gets put on, which I am going to have to hot glue in, I am going to finish the entire assembly with DIY truck bed liner matieral. It’s cheap, it’s matte black so it won’t stand out on stage, and it is durable as all get out. Yay, Another fellow woodworker / musician !! I think the two go hand in hand. 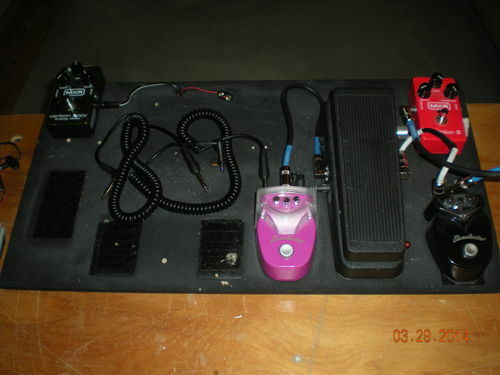 Nice pedal board project. You might enjoy reading this older entry from my blog…. This was on a piece of Baltic birch ply, painted black.